Today, representatives from tech companies including Amazon, Apple, AT&T, Facebook, Twitter, and Google will testify before the Senate Commerce Committee on issues of consumer data privacy at a hearing with the limply stated purpose of finding “what Congress can do to promote clear privacy expectations without hurting innovation.” A former Google senior research scientist who resigned from the company this month is hoping the committee will dig further. 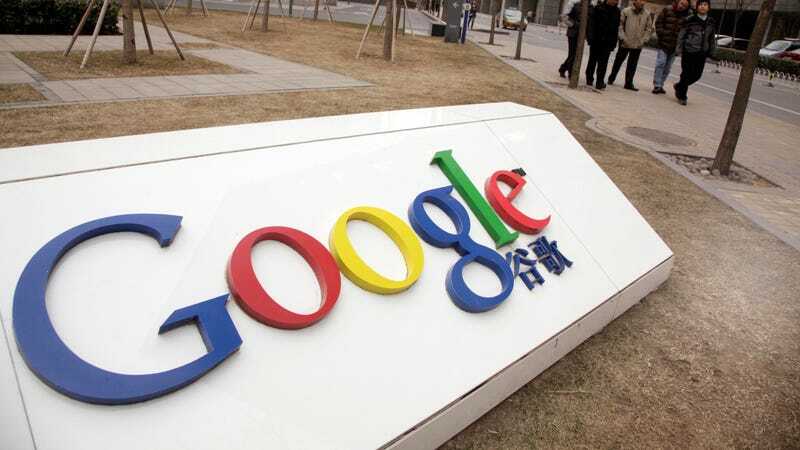 The existence of Google’s censored Chinese-market search product, dubbed Project Dragonfly, became public in August after nearly 1,400 employees drafted and signed an open letter to company leadership, decrying Dragonfly as unethical. Shortly thereafter, Dr. Jack Poulson, along with a handful of other employees, resigned from the company in protest. Poulson’s concerns are shared by a number of civil rights organizations, like Amnesty International, the Electronic Frontier Foundation, and Human Rights Watch, which drafted their own open letter late last month. Poulson argues in his letter to the Senate committee that Dragonfly violates Google’s internal principles regarding artificial intelligence. The company released these principles in the wake of employee protests over the company’s work with the U.S. Department of Defense on Project Maven, an effort to develop AI that automatically identified objects and people in military drone footage. Gizmodo first reported Google’s work on Project Maven in early March, and the company said it would not renew its DoD contract in June following months of internal and external pressure against the program. As Poulson points out, “Project Dragonfly directly contradicts the AI Principles’ commitment to not ‘design or deploy’ any technology whose purpose ‘contravenes widely accepted principles of [...] human rights.’” Poulson also corroborates earlier reporting from the Intercept that Dragonfly would link Chinese users’ search history with their phone numbers, potentially allowing China’s government to easily track their activity, and would abide by Beijing’s “censorship blacklist,” which filters out certain search terms. While concern for Chinese citizens’ data is likely low on the list of the Senate’s concerns, Poulson’s intention seems to be shining a light on Google’s unwillingness to follow its own stated principles and the widespread effects that may have on Google’s technology worldwide. Senator Thune set the tone for the upcoming hearing by stating that “Consumers deserve clear answers and standards on data privacy protection.” Given the scale and social impact of the technical systems being deployed by Google and other corporations, I would add that greater oversight and accountability of not only data, but also the systems that are designed and deployed based on such data, is urgently needed. Until the beginning of this month, I worked in Google’s Research and Machine Intelligence division as a Senior Research Scientist, where one of my primary responsibilities was improving Google’s search accuracy across a wide variety of languages. I was compelled to resign my position on August 31, 2018, in the wake of a pattern of unethical and unaccountable decision making from company leadership. This culminated in their refusal to disclose information about Project Dragonfly, a version of Google Search tailored to the censorship and surveillance demands of the Chinese government. Like most of the world, including most Google employees, I learned about this effort on August 1, 2018, from public reporting. It is notable that Project Dragonfly was well underway at the time the company released its AI Principles. As has been widely understood, by human rights organizations, investigative reporters, Google employees, and the public, Project Dragonfly directly contradicts the AI Principles’ commitment to not “design or deploy” any technology whose purpose “contravenes widely accepted principles of [...] human rights”. • A prototype interface designed to allow a Chinese joint venture company to search for a given user’s search queries based on their phone number. • An extensive censorship blacklist developed in accordance with Chinese government demands. Among others, it contained the English term ‘human rights’, the Mandarin terms for ‘student protest’ and ‘Nobel prize’, and very large numbers of phrases involving ‘Xi Jinping’ and other members of the CCP. • Explicit code to ensure only Chinese government-approved air quality data would be returned in response to Chinese users’ search. • A catastrophic failure of the internal privacy review process, which one of the reviewers characterized as actively subverted. Each of these details was internally escalated by other employees to no avail, and many of them were discussed extensively on internal mailing lists; I understand that such discussion has since been increasingly stifled. I cannot speak for those who escalated these concerns, but I share their fear of the possible consequences. I am part of a growing movement in the tech industry advocating for more transparency, oversight, and accountability for the systems we build. The primary goals are laid out in the Google Ethics Code Yellow Petition, which not only continues to circulate throughout Google but has also been endorsed by 14 human rights organizations and several technology experts. I humbly ask that The Committee on Commerce, Science, and Transportation call on Google’s representative for the hearing, Mr. Keith Enright, to respond to the sincere and credible concerns of the coalition of 14 human rights organizations who drafted an August 28th Open Letter To Google. I also ask the committee to inquire about how Google is meeting its commitments to privacy under its own AI Principles and the Global Network Initiative, of which Google is a member. Dragonfly is part of a broad pattern of unaccountable decision making across the tech industry. It has been made clear, both by word and by action, that the leadership at Google will be clamping down on the types of internal investigation that were necessary to bring Project Dragonfly to light. I would hope that The Committee would help protect the environment needed for future whistleblowers by taking steps to guarantee ethical transparency and oversight across Silicon Valley.